For those who have been under a rock or for some unknown reason have not heard of the very controversial and great Victor Wesley, let me at least give you a brief background. Starting with great Victor three time World Champion in the Highland Dance World. Once totally judged by Independent Judges, once half SOBHD judges and half independent, and the third time all SOBHD judges. Victor has remained in the dance world  the consummate professional, Director of the Academy of the Dance, Artistic Dir. Wilmington Ballet Company student of the late Jamie Jamieson, partner to Dame Margot; the list goes on and on. Needless to say his expertise in all matters related to all dancing is much sought after throughout the world. Victor apart from being a former multi-Adult World Champion Dancer is also an (Independent) Judge of Highland Dancing. Controversial well his dancing ability and expertise is not controversial. Even those who have personal axes to grind and heads of organization who are usually on the other side of his philosophy are in complete agreement that Mr. Victor Wesley was one of the greatest dancers of his era. They may not think of him kindly but his dancing is always spoken of with great awe. So what is so controversial about Victor? Victor is one of those delightfully rare people who truly speaks his mind. His views on what has happened in the world of Highland Dance (with his undisputed expertise on the subject) tend to send shockwaves around the Highland Dancing World. Well at least the part run by the organization that is usually the brunt of Victors criticisms,the Scottish Official Board of Highland Dancing. Victor and the SOBHD have been at it for decades. There have been claims made against his 1969 World Champion (Cowal) status by the SOBHD, he is unable to teach and have his students compete in the country he has chosen to live, even though he is a professional dancer and teacher with a studio of nearly 500 dancers. Nearly the equivalent of all the registered Premier dancers in the USA. Recently Victor was one of the judges at Royal Braemar and he also attended the Cowal Gathering therefore I present a letter from Victor! For me judging at the Royal Braemar Highland Gathering, the most prestigious games in the world was nothing less than nostalgic. It was not only an accolade in full recognition of my knowledge as a world recognized independent adjudicator, but a testimony to my prior contribution in Highland Dancing as a former multi adult world champion of this art form. 22 years ago I competed at the Royal Braemar Highland Gathering and won all the top awards that day, in truly open to the world competition. I also won the medal for the best overseas dancer bringing home a little recognition to the USA of which I am a citizen. Braemar has always had the most respected and notable names of the highland dancing world represented as its judges and undoubtedly as dancers. It is a gathering that all overseas dancers should not miss when visiting Scotland. The Royal family, who are also its patrons, attends the gathering. Braemar, unquestionably has great history as well as dignity and represents all that is majesty. To be invited to adjudicate or to compete is the ultimate in recognition and is a feather in ones cap. For judges it is the crown jewel, in recognition and respect of ones career and of ones knowledge.This is a highland gathering that has always been void of restriction and dictatorial regimen in confinement of highland dancing. One where a dancer can show off their real talents by displaying prowess rather than being confined in restriction of ability through the robotics of diluted technical artistry as is set out in the name of standardization and recognized through the SOBHD. The dance competitors are adjudicated impartially regardless of whether you wear navy blue or black underwear (knickers) and regardless of whose student you are or which dance affiliation you belong to. At this great highland gathering both SOBHD and Independent non board judges and dancers are represented in complete harmony and in the true essence and respect of competitiveness, where the quality of the dancing is un-surpassed even by the Cowal Gathering. Braemar is totally open to the world unlike the Cowal Gathering which for 30 years now is a restricted title eluding to premier status, a technicality of circumvention to the fact that rather than being freely open to the world and where the SOBHD host their closed and confined world championships. Where only their (SOBHD) affiliated organizations may compete or adjudicate. This raises a dilemma of ethical morality in a world where there are democratic ideals. Braemar is well attended and exceptionally organized with pinpoint precision and only promotes the real traditions of Scottish Highland Dancing in the true Highland spirit. The completely open dancing competition drawing top dancers who are themselves Champions or premier level competitors attend that day where they are judged impartially regardless of affiliation or steps, giving free style of motion and ability to the dancers dexterity. It should be mentioned that the most outstanding adult competitor of the day was again this year a Scottish champion competitor, Roo Killick, a very strong adversary who is no less than World Championship caliber, and is a non-board dancer. Killick a true adult dancer, not a child in an adult event, showed by far the greatest versatility in being able to go beyond the confines of the SOBHD standardized work and displayed an artistry in all dances that were quite unmatched. She was commanding in her presence, had beautiful line in deportment and most certainly powerful in her match against all other competitors from throughout the world. The virtuosity she displayed was exciting to watch while remaining in dignified full grace of a great lady of the dance. Killick best exemplified all that true Highland dancing and traditions represents. It is interesting that she is denied from openly competing under SOBHD yet, remains one of Scotlands ambassadors. Apparently due to SOBHD dogma, the traditions and the ability of any former competitor now teacher to be able to teach a student to greatness is in jeopardy of being lost in the competitive world of Highland dancing today. Where many dancers are cloned to look similar and even dress alike, to assist a judge in giving a result in competition. Where teachers are now harnessed to comply with restrictive levels of ability, all prevalent through SOBHD doctrine and control, which only maintains to suppress the true artistry and the traditions of this magnificent art form further reducing it to a limited sport. One (limited sport) whereby dancers now retire before they have started. Another wash out (rainy day) nothing spectacular just over 500 dancers, many from overseas, many competitors represented themselves as premier dancers but were clearly lower level intermediate standard that have arrived at winning the pre-levels allowing them to compete. In my professional opinion nothing spectacular not even the new world champions. 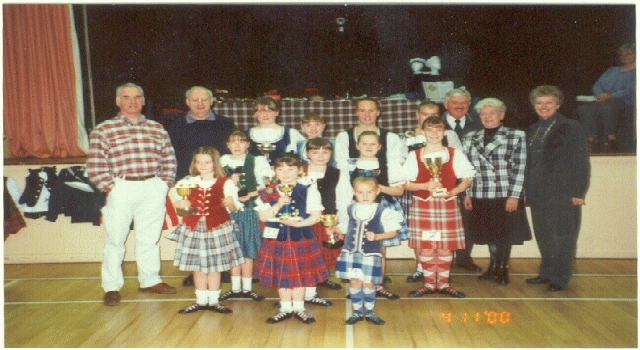 Many of the awards were given to overseas dancers, which it would suggest would keep them coming back to Cowal and keep their affiliated teachers happy. The judges (also in my opinion) were a grab bag with only three on them outstanding former competitors themselves; the others were also rans who had passed the SOBHD test. The big question loudly asked by Scottish SOBHD members who were former dancers and teachers of notoriety was  who are these people? We have never heard of them. As always Cowal got the entries regardless of which organization runs its confined worlds. The costumes were certainly more spectacular than the dancing. A special mention goes to two judges of the day Ann McIlroy and Gregor Bowman as the best dressed; they showed that they really knew how to dress for the occasion. In conclusion to this un-inspired damp day of premier world-class robotics, I was impressed with the well-run organization and protocol, presided over by Mr. Forsyth, he did a great job. Keep it up Billy! Regardless, I met many colleagues and reminisced about the times when dancing was really dancing. After all the contention and controversy as to who the 1969 Adult World Champion was that year it was nice to see that my name was not only mentioned for all the world to witness but that it was all engraved on the championship. Many dancers and judges that were a part of that eventful day as The Highland dancing Specialists Assoc. are still part of the Highland dancing world. I have been judging for 34 years and have been restricted within the United States by the SOBHD to have any student of the dance compete from my school regardless of my professional qualification. Until the day that people see the great injustice of these matters and dancers again compete in front of judges who were the really great name in highland dance, its legacy to history; we stand to lose the traditions, through manipulation, greed, ignorance and fear. I feel fortunate in life to have had a successful career in Highland dancing although denied under the auspices of the SOBHD, furthermore to be fully recognized within the professional world of classical dance. Signed Victor W. Wesley, Dir. Academy of the Dance/ Artistic Dir. Wilmington Ballet Company.